Like anyone, America has its good days and its bad days. October 10, 2015 was one of our good days. In Michigan, Maryland, Tennessee, Alabama, Oklahoma, Oregon and Washington DC, hardly anyone showed up to protest, but concerned neighbors and churches were there anyway to show support. Phoenix, AZ was the only place that actually felt like a protest, but though a lot of guns were seen, thank God it passed peacefully. One of the best stories came from the Noor Islamic Cultural Center in Michigan, where one lone protestor showed up. A Caucasian man exited the mosque to start a conversation with her. She thought he was Muslim and responded with “Get behind me Satan!” The man told her he was actually Jewish, and after some dialogue got her talking with some of the Muslim women from the mosque who also affirmed how much they were against the violence and murder of ISIS-type groups. The story ends with the protestor coming into the mosque to join a special breakfast they had prepared for all the protestors! She thought she was taking a stand against the enemy and discovered new friends. Meanwhile, many interfaith groups across the country planned events to show their support for the Muslim houses of worship, some including positive social action plans. The Huffington Post concluded that the end result of the protests, in fact, was a large outpouring of love and interfaith support for the Muslim community. Well done, America! Thank you for your prayers for peace this weekend. Thank you to those who showed up at a mosque. 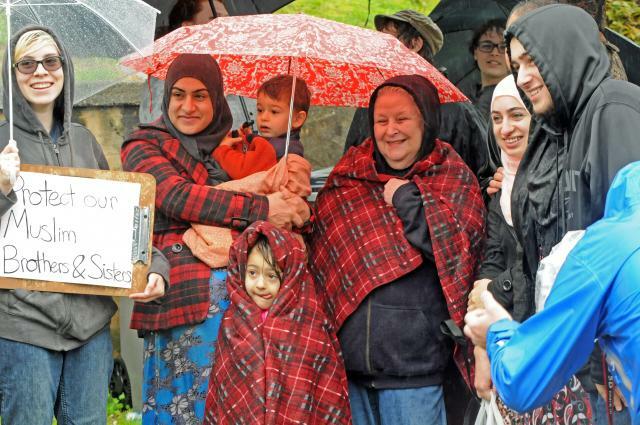 Way to turn hate away and show that #LoveYourNeighbor is still worth standing in the rain for!